There were many already in the community whose gestures of kind help and friendship eased the way for our grandparents and parents during the early settlement years. Mr. W. R. Powley lent his team of horses, “Nip” and “Tuck”, to Eijiro Koyama so that he could bring his family from Coldstream to Winfield. Mrs. Campbell-Brown of Amory Ranch, Oyama, taught Kimie Koyama to speak, read, and write English. Others taught the women about Canadian customs and food preparation while orchardists and farmers provided employment for the men. Over the years these connections evolved into lasting and endearing friendships. We who followed that first generation of Issei will be forever grateful. 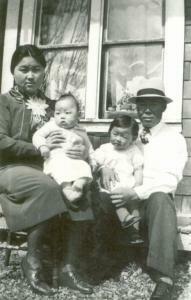 Seimatsu and Kimie Takenaka with their children Harold and Addie, outside Grandpa Koyama’s house in Winfield, 1939. The photo was taken prior to the Takenakas’ move to Fintry, where Seimatsu worked for Mr. Stewart at the Fintry Estate before returning to the McDonagh orchards in Winfield. The Takenakas had eight children: Nancy (1935), Addie (1937), Harold (1938), Judy (1940), Grace (1942), Gerry (1943), Lawrence (1951), Ron (1956). 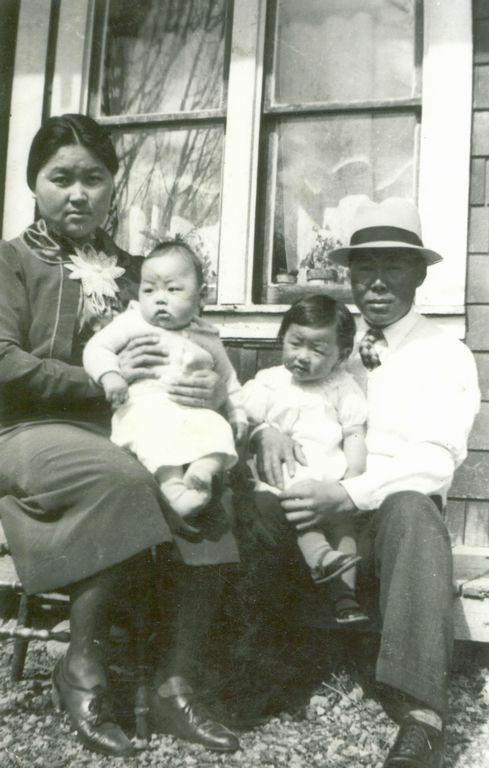 (L-R) Kimie Takenaka (nee Koyama), Harold Takenaka, Adelaide Maehara (nee Takenaka), Seimatsu Takenaka.